Click on an instrument above to view personal bios. Southbound, (formerly The Southern Comfort Band) is a Dallas, Texas based band playing the best in Southern rock and classic rock. The band can be seen on weekends at various D/FW bars, clubs, biker rallies, and private parties so be sure to check our Calendar for upcoming shows near you, and get on the Mailing List to be informed of all the latest news and events. Southern Comfort was formed in early 2000 when brothers Odin, Ryan, and Aron Mattes and Caleb Blanton, who had been playing together in various projects for the past several years, decided to put together a gigging band. Bass player Danny Stone was added and the band began putting together a song list while searching for a drummer. Shortly thereafter, Jaime Lopez joined the band on drums and Southern Comfort played its first gig. Southern Comfort quickly became one of the busiest bands on the local bar and club scene and the band has stayed busy ever since. In the summer of 2001, bass player Danny Stone, extremely busy with a full time job, as a jazz studies major at North Texas University, and playing bass for both Southern Comfort and another local band, told us that he would have to leave the band. The search for a new bass player was quickly ended when we met Steve Sainton. Southern Comfort had become a very busy band, and a short time after Danny's departure drummer Jaime Lopez also told us that he would have to leave the band to spend more time with his family. As the search for drummers began, Steve mentioned a drummer, Jason Freeman, who he had played with in a previous band. Jason joined Southern Comfort in September of 2001, and the band went to work immediately adding new songs to our repertoire. Shortly after joining Southern Comfort, Jason took an internship which took up most of his time, necessitating yet another change of drummers for Southern Comfort. After several agonizing weeks of auditioning drummers, suddenly Chris "CJ" Fonck showed up in January of 2002. A few short months later Steve announced that he was leaving the band to pursue other projects, and as luck would have it Danny Stone returned to Southern Comfort to fill the role of bass player. Unfortunately, CJ decided to hang up his drumsticks and retire from music in the fall of 2002, so once again we were on the hunt for a new drummer. After a brief stint with drummers Brian "H-Bomb" Ferguson and Steve Coil our search ended when we found David Spooner, a veteran Dallas drummer. Part IV: Is This Spinal Tap? In August of 2003 bass player Danny Stone left to pursue music as a full time career. Luckily for us, we hooked up with veteran Dallas bass player Jay Harris, who brought a new dimension of stage presence to the band in addition to his strong vocals. The latest chapter in Southern Comfort history occured in November of 2003 with yet another drummer change, with Austin Allen taking David Spooner's place behind the kit. In late 2003, the folks who own the name Southern Comfort dropped us a line to let us know that they would really like it if we stopped using that name since they owned the trademark. 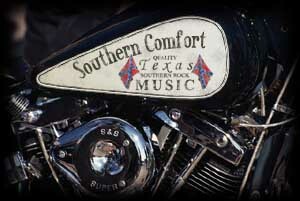 Both parties came to a mutual agreement and we changed our name from The Southern Comfort Band to Southbound. Southbound continued to play just about every weekend until December of 2004. 2005 started off with Southbound taking a much needed break. Jay is playing with the local band Delta Rage, and Austin keeps busy with a variety of different projects. Not much to report here. Various band members were occasionally spotted hanging in the clubs that we used to play but thankfully there are no pictures to prove anything. Except that picture of Aron. 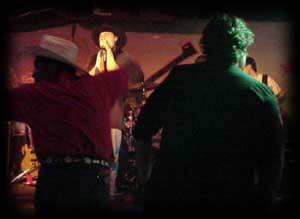 In early 2006 Southbound rides again, with one change in the lineup, a new bass player. Unfortunately, the bass player spot has been filled by several temporary players this year. We're hoping to land a permanent replacement soon. Gigs were sporadic in 2006 and early 2007, and most have featured original bass player Danny Stone, although Dino Villanueva has filled in on the bass a couple of times. In the summer of 2007 bass player Danny Stone moved to New York City, followed in the fall by drummer Austin Allen's move to Baton Rouge. Southbound went from the best rhythm section in north Texas to no ryhthm section. There's going to be a test on this so I hope you took notes. Southbound consists of Odin Mattes (guitars), Ryan Mattes (vocals, harmonica, percussion), Aron Mattes (guitars & vocals), Caleb Blanton (keyboards & vocals), Austin Allen (drums).